Czech beer brewing is a history that dates back to 993 at Břevnov Monastery in Prague. In that time, brewing was primarily done at monasteries, as the Czech Republic was under a 250 year ban on nonmonastic brewing, which was only lifted in 1250. From the beginning, Czech beer used hops in its brewing, for several hundred years before other beer loving countries embraced the technique. Czech hops became a highly prized product for producers of beer, as other countries wouldn’t grow their own hops for brewing for hundreds of years. Once the beer ban was lifted, breweries across the country were granted rights to brew beer for the first time outside of monasteries; the cities of Ceske Budejovice in 1265, Plzen in 1290, and Svitavy in 1256 were some of the first cities to be granted the right to brew some of the first beer in the Czech Republic. Though the rich tradition of beer brewing has been a large part of Czech culture, the beer brewed in the first breweries was known as bile pivo or “white beer”. The brewing technique used a top-fermenting yeast, producing a cloudy wheat beer. Stare pivo, or “old beer” was brewed with a bottom-fermenting yeast; these beers were brewed at low temperatures for longer amounts of time, producing some of the first lagers. It’s believed that lagering originated in Bohemia, and the practice passed on to Bavaria and beyond during the second half of the 15th century. 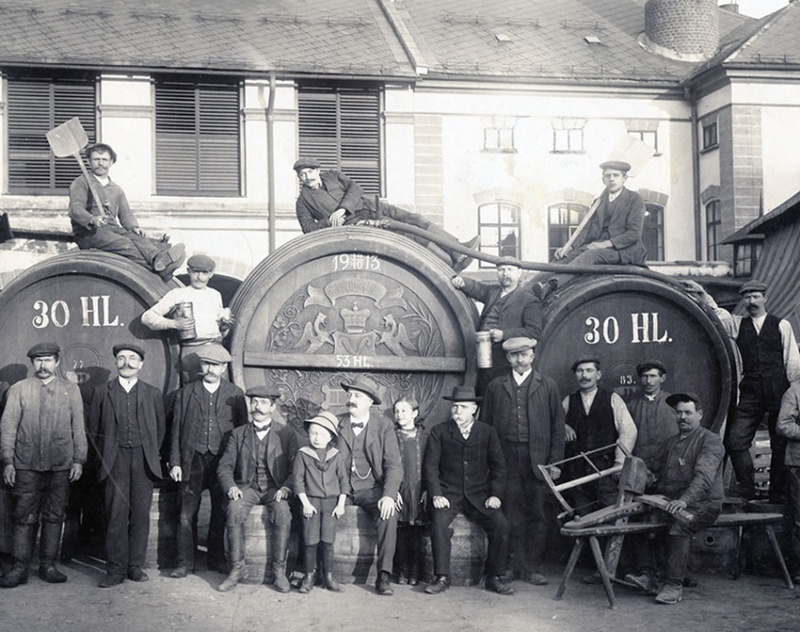 Old beer and lagering gradually faded out of the Czech beer brewing tradition; along with the fading traditions, Czech breweries were gradually destroyed in wars and conflicts in the country. The Brevnov brewery in Prague, along with the Brevnov monetary, were destroyed in 1420, and were not rebuilt for three hundred years. Despite the destruction, the Czech tradition of brewing beer continued on, focusing in top-fermenting beers, mainly made with wheat. The mid-19th century brought back the bottom fermented beers from Germany, thanks for improvements in transportation and trade; not many remembered the darker beer that their ancestors had introduced to their Bavarian neighbors, and so the Czechs feel in love with the change from the lighter beer they had been used to drinking. Breweries quickly began working on their own brewing methods for the darker beer. Despite other breweries producing darker beer, in Pilsen in 1842, the brewery developed its own technique of drying its malt with indirect heat, resulting in a crisp beer, not quite as dark as the German brews, but a more golden color; breweries began switching over to bottom fermentation in the hopes to replicate their successful innovative technique. Thus started a revolution of brewing techniques in the Czech Republic; breweries began switching to bottom fermenting techniques, and those that couldn’t often closed. Breweries began consolidating as the 20th century approached, and wheat beers had almost completely disappeared. Want to listen the whole Pilsner story ? Then pick one of our tour and join us! With the onset of the communist era in 1948, many breweries closed, reducing the number of producers rapidly. Those who survived produced mainly two types of beer, a pale or dark lager, and were restricted to such for the next 40 years. One of the few positives to come out of this era was that the Czechs weren’t able to update or renovate their breweries, preserving old fashioned techniques for brewing and malting, which had otherwise disappeared across Europe. As capitalism was reintroduced into the country, more and more smaller pubs and breweries began popping up, and the breweries began to experiment with brewing techniques, flavors, and even revisiting brewing wheat beer. With more than 250 breweries, the Czech Republic has maintained its long history of beer brewing despite multiple setbacks and restraints. That hasn’t stopped the country from producing some of the world’s best beer, leaving it no wonder that the Czech Republic is the number one consumer of beer per capita in the world.